Hands up if you thought last year was a great year for the stock market? Yup, most people. 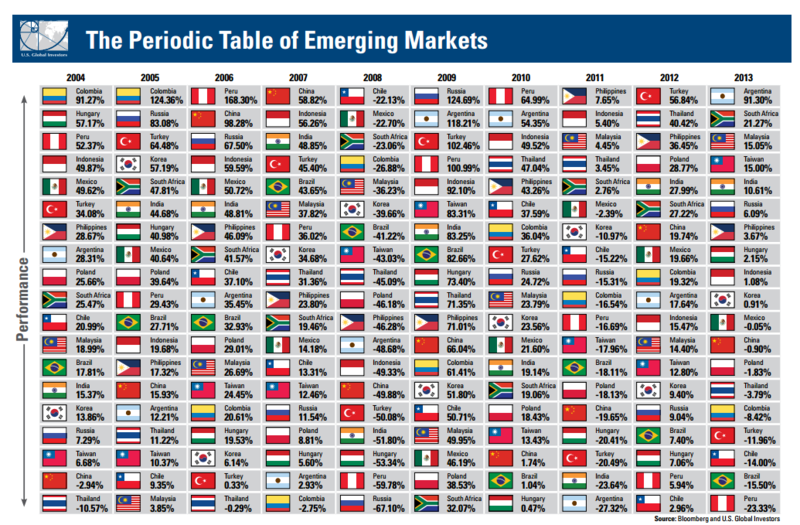 It was in the US and Europe, but Emerging Markets by contrast had a pretty awful time. So, besides showing the value of diversification, what else does it hint at for 2014. Are Emerging Markets looking cheap? We think “depends” is the answer. Yes, this is a bit gutless and won’t get us air-time on Fox expounding our market changing view anytime soon, but we think it is pretty close to the truth. 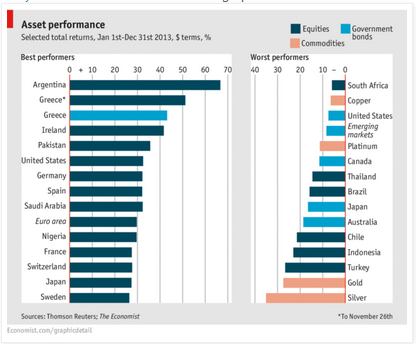 Have a look at this graph to see the variation of returns. Some like Argentina, a market we would only foist on our worst enemy did spectacularly, well, but were the only emerging market of note to beat either the US or Europe. We think that several countries aren’t due, for a variety of reasons. India and Brazil due to chronic inflation and lack of reform which will hurt investor returns and the currencies of these places. Russia due to the above, with the added instability of a leader who sees an empire in the old fashioned sense of Soviet times. Of the large countries, China is probably one place that is almost borderline, but the reform arm wrestle hasn’t yet been won by the liberals, although there signs of hope. Still all four BRIC are worthy of considerable skeptism. We don’t have much hope for Turkey. Erdogan seems to be on a slide to complete paranoia and the war next door in Syria surely isn’t helping. Venezuela is heading for imminent crisis and Argentina seems likely to have enough luck to avoid a crisis for now, but just barely. None are worth the risk involved for our money. Yes the rest of the world isn’t perfect, but the problems there seem insurmountable. China, despite slowing, is now big enough to generate enough growth from 5% to support all of South East Asia. Europe, having failed to collapse, has exceeded expectations and helped emerging Europe. Many parts of Africa & Latin America are all likely to be as good as last year, if not better. There are plenty enough options around. So what’s keeping it down? Tapering – in a word. The flow of cheap money from the United States is easing of steadily and this is likely to continue this year. The flow of money from overseas, where it has been seeking better returns back to the US is considered very likely to continue. But given it is no longer unexpected, how much more impact will it have? The truth is difficult to know. What is known for sure, is that rebound, when it comes, will include very tasty returns. Compare the returns of last year to recovery years like 2009 or even a normal year like 2012 or 2004. The question is, when will tapering’s effect end and the next cycle of recovery begin?